*Patented (US#6,939,274B2) EZ SQUAT Dumbbell is the faster, safer, more effective way to Squat and Dead lift. Designed for rapid weight changes, E-Z SQUAT instantly attaches to any dumbbell handle size or weight easily handling 200 pounders. Superior to Barbell's, E-Z SQUAT keeps loads off of athlete's spines and safely close to bodies center. With Ergonomically Angled, Non-Slip Handles that encourage Perfect Squat positioning. But that's not all! 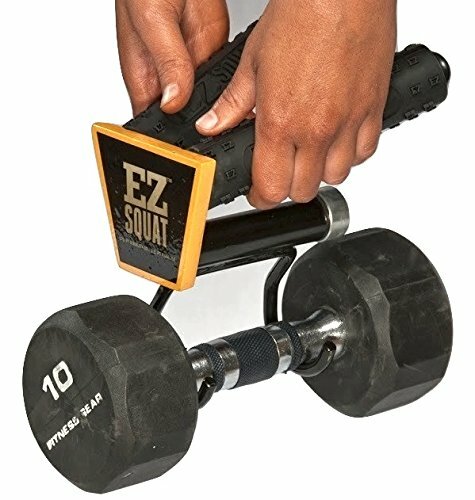 EZ SQUAT Dumbbell can even be used as T-Barbell Row Handles or to perform Close Grip Pull Ups! EZ SQUAT is Commercial Grade featuring a Full Lifetime Replacement Guarantee * US patent # 6,939,274,B2 *** FITS ALL HEX & PLATE STYLE DUMBBELLS to 200# with MINIMUM 5- 3/16" HANDLE LENGTH BETWEEN DUMBBELL HEADS. USE FOR SQUATS, DEADLIFTS, T-Barbell Row Handles & Close Grip Pull Ups! ERGONOMICALLY ANGLED GRIPS Position Body For Perfect Squat Form! SURE HOLD COMFORTABLE Rubberized Handles! COMMERCIAL GRADE WELDED STEEL with Powder Coat Painted finish! PATENTED DESIGN USA BUILT with Full Lifetime Replacement Warranty! If you have any questions about this product by EZ Squat, contact us by completing and submitting the form below. If you are looking for a specif part number, please include it with your message.